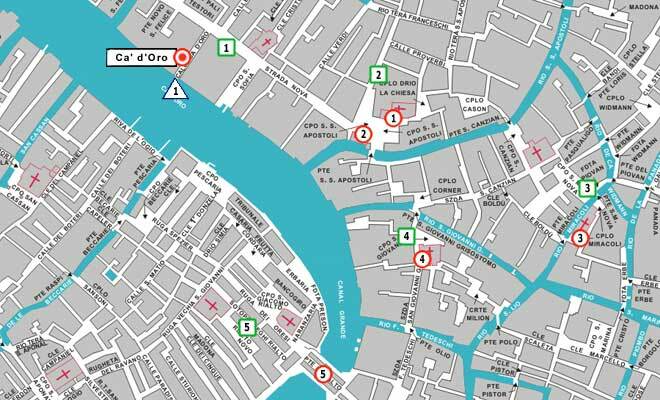 Venice Hotels Guide See Ca' D'Oro on the interactive Map of veniceXplorer. 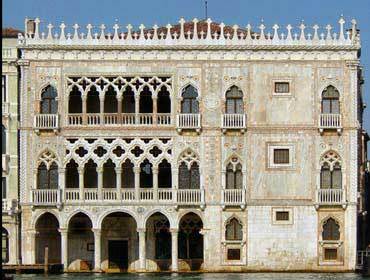 Ca' d'Oro (correctly Palazzo Santa Sofia) is one of the older and most beautiful palaces on the Grand Canal in Venice. It has been known as Ca' d'Oro (golden house) due to the gilt and polychrome external decorations which once adorned its walls. The Palazzo was built between 1428 and 1430 for the Contarini family, who provided Venice with eight Doges between 1043 and 1676. 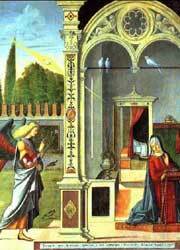 The architects of the Ca' d'Oro were Giovanni Bon and his son Bartolomeo Bon. 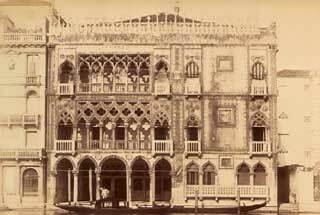 The principal façade of Ca' d'Oro facing onto the Grand Canal is built in the Bon's Venetian floral gothic style. On the Ca' d'Oro's ground floor a recessed colonnaded loggia gives access to the entrance hall (portego de mezo) directly from the canal. Above this colonnade is the enclosed balcony of the principal salon on the piano nobile. Following the fall of the Venetian Republic in 1797 the palazzo changed ownership several times. One 19th century owner, the ballet dancer Marie Taglioni, removed the Gothic stairway from the inner courtyard and also destroyed the ornate balconies overlooking the court. In 1922 the palazzo was bequeathed to the State by its last owner and saviour Baron Giorgio Franchetti who had acquired it in 1894. Following extensive restoration to its former glory (including the reconstruction of the stairway), it is now open to the public as a gallery. the gallery is home to the whole of the Franchetti collection, and has gathered more works over time. 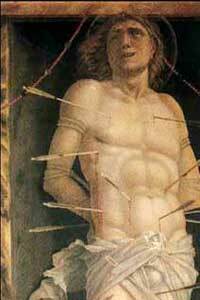 Among the many beautiful works is 'Venus' by Titian, the 'Annunciation of Carpaccio' and 'Mantegna's San Sebastiano'. The gallery also houses works of art by Flemish and Dutch painters, as well as some works by Tintoretto, Giorgione and Paris Bordone.